Someone reading this newsletter--maybe you--is so frustrated right now you don't know what to do. Your prayers have gone unanswered so long that you keep asking yourself, "Is God listening to me? Does he care? Is there even a God out there?" Now I know many of you are not Christian. You don't believe as I do. Many of you have no spiritual beliefs at all. You don't think God exists and you're living life your own way, thank you very much. In this Inspire-O-Gram, we're going to address two crucial issues for singles: Is God listening to my prayers? and Does God exist? For many years I wondered myself whether God was listening to me. When I prayed, there was no response. God didn't talk back to me, at least not audibly. I kept hearing radio preachers say, "God spoke to me," or "God told me." I wondered what was wrong with me. Why didn't he talk to me like that? 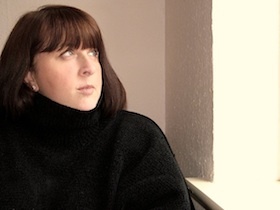 For you frustrated Christian singles, let's take a look at what I discovered reviewing the past 40+ years to answer the question, Is God listening? Does God exist? Prove it! Now, for those of you who are seeking, for those who don't believe God exists or have strong doubts, I'm going to refer you to a first-class web site that answers every single question you have, and does it in a logical, reasonable way. It's called godandscience.org. I give it my highest recommendation, so pay it a visit and see if it makes sense to you. since it's foreign to our ears. with petty doubts and fears. like a subtle summer breeze. and you're driven to your knees. that softly calls your name. as it warms you like a flame. in a message plain and true. and He meant it just for you. that's as tender as a dove. March's quote comes from Winkie! It seems that Christians are just drooling to know the will of God for their life. But that's because we want to be in control, instead of God. It's reassuring to know what's coming so we can prepare for it, but that's not how God operates. As Winkie points out, if you rely on God's direction and wisdom, you'll get it. If you rely on your own, well, good luck, then. You can spend half a lifetime learning the truth of that statement, as I did, or you can wise up and start letting God run your show now. Your "aha" moment will come when you finally realize God is smarter than you, he does know what's best for you better than you do, and that he loves you more than you love yourself. If your alarm clock makes you ask, "Why bother?" Some mornings your alarm clock goes off and you ask yourself, "Why bother getting out of bed?" The answer to that question is hope, and if you don't have much hope right now, you need my ebook, Hope for Hurting Singles. This 146-page PDF download will help you clarify your purpose in life. You'll overcome that blah feeling and find new enthusiasm. Best of all, you'll put past disappointments in perspective so you'll be able to face the future with renewed passion. It's only $9.97 in PDF format, and it's now available for Kindle as well! 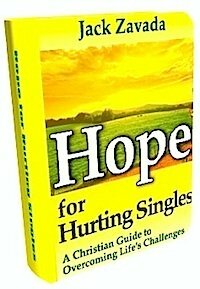 Get all the information at Hope for Hurting Singles. Easter is my favorite holiday, beating Christmas by a mile. That's because fulfillment always beats out its promise. The resurrection of Jesus changes the face of death for all His people. Death is no longer a prison, but a passage into God’s presence. Easter says you can put truth in a grave, but it won’t stay there. Never let anything so fill you with sorrow as to make you forget the joy of Christ risen. 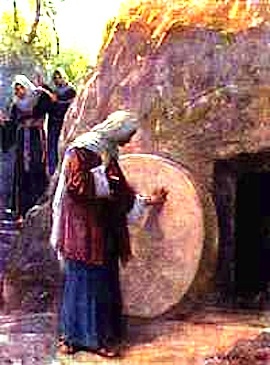 Bonus feature if you've read this far: A few years back I wrote this article for www.christianity.about.com titled 7 Proofs of the Resurrection. Traffic at www.inspiration-for-singles.com is waaaay, waaaay down, thanks to Google's constant tinkering with its "standards". I expect to suffer another hit soon as I try to make the site mobile-friendly. You can help, simply by telling a friend about the site or forwarding this newsletter to someone who'd appreciate it. I'm a one-person operation, working feverishly to meet the ever-changing Google requirements while writing new articles for the site and this newsletter every month. Spring time has finally arrived in Illinois, USA, and Louie the dog and I are enjoying the pleasant weather. February 2015 was the seventh coldest February on record in the state, with an average temperature of 18 degrees F. Yowch! I hope you have a blessed, happy Easter. As usual, if you'd like to send me an email, just use this Peeps-free contact form. Hang in there. Remember Jesus died and rose for you and will always love you with a God-sized love, and lemme tell you, fellow singleton, that's as big as it gets!